How could such a terrible thing happen? Can people recover from these experiences? Can our family continue after this trauma? Can anyone understand how I feel? What can I do to recover from abuse in the past? How does abuse and trauma affect relationships? 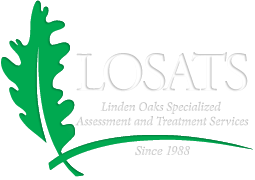 Linden Oaks Specialized Assessment and Treatment Services (LOSATS) is prepared to help you answer these questions and support the healing process. LOSATS is a private agency specializing in treatment, training and consultation for victims, offenders and families affected by interpersonal violence and trauma.